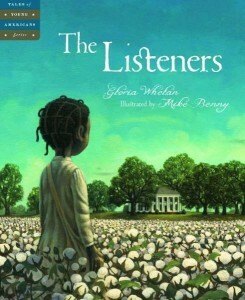 The Listeners, by author Gloria Whelan, is the lyrical story of a young slave girl named Ella May. Though Ella May “starts her backbreaking work at the same time as the sun,” picking cotton isn’t her most important job. Listening is. Ella May and two other young children are saddled with the responsibility of listening to what the white folks are talking about and carrying what they’ve learned back to their parents. They are given this job because their small bodies are easier for white folks to miss than the tall, thick bodies of the adult slaves. In the book, Ella May and her two friends hear all sorts of news that they carry back to the slave cabins and recite for their anxious parents. They learn they are getting a new overseer – great news, since the current overseer likes to flick them with canes when he is angry. They learn that a neighboring planter has offered to purchase Ella May’s daddy, but Master decides against it because he is the best cotton picker on the plantation. And they learn that a new president named Abraham Lincoln has vowed to set the slaves free. The Listeners is a sweet and haunting tale that offers young readers an “in-your-face” slice of life from an era long ago. Although the book seems a bit wordy for a picture book, author Gloria Whelan does manage to touch readers with Ella May’s stark and wistful description of life on the plantation. Illustrator Mike Benny captures the somber mood of slavery with dark, round faces, wistful eyes, and stark cabins lit only by a lonesome fire. There are beautiful pictures of slaves filing home, one-by-one, silhouetted against the fading sunlight; slave children hiding just beneath the windows of beautifully decorated, brightly-lit mansions, and even exhausted Ella May sitting among the cotton balls as she summons the energy to resume her work. The Listeners is a great book to introduce the subject of “hope” to the elementary classroom. It can also be a supplement for discussions about citizenship, family, belonging, and American history. But more than anything, it can be a tool to help children understand the unbreakable bonds of family, the role each member plays, and the fact that every individual is an important part of society.